1. Show consideration when overtaking or crossing in front of hikers. 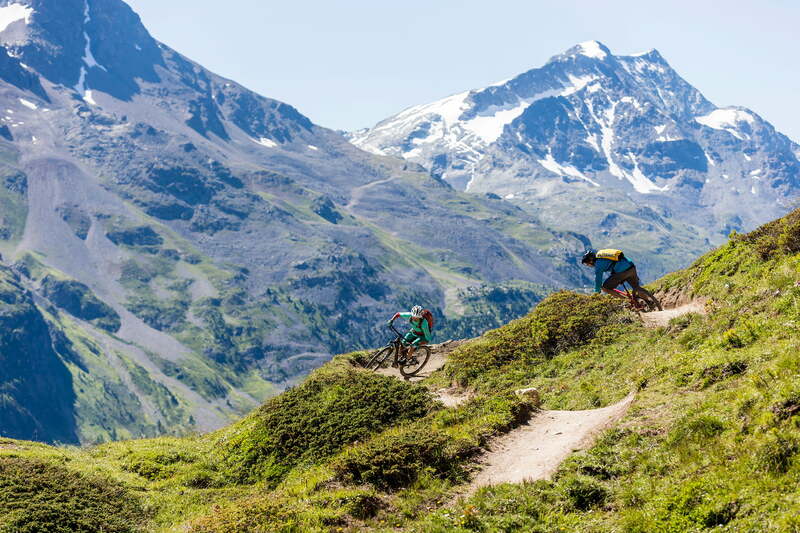 The Graubünden mountain biking routes often follow single tracks that are also signposted as hiking trails. Hikers always have the right of way. 2. Close any gates and fences that you have opened. If the farmer finds that his cows have escaped, you'll be lifting your mountain bike over fences next time. 3. Treat with care what you yourself enjoy – unspoilt nature, animals, plants and your own good reputation. Only ride on signposted trails and paths. Cross-country riding through woods and meadows harms animals and plants and also damages our reputation as mountain bikers. 4. Do not lock your wheels when braking. This damages the trail as well as your bike. Each village has waste disposal facilities. By using these you'll be protecting the Graubünden mountain environment. 6. Ensure that you are well equipped. Your basic equipment should include a helmet, gloves and bell in addition to protection against the rain and extreme temperatures. Graubünden's Alpine environment is prone to sudden changes in weather. To avoid hypothermia and exhaustion, check the weather forecast beforehand as well as the demands of your chosen route. Riding on these routes is strictly at your own risk. To ensure that you do not stray from your route, make use of the route guides and specialised mountain biking maps available in bookstores as well as the extensive information on the internet. 9. Note down the following numbers: Police 117, Emergency Services 144, Air Rescue Service 1414.